As LIU Post and LIU Brooklyn merge to become OneLIU, so will their school colors. The arrays of green and gold across Post’s campus will soon become a distant memory, and shades of blue and gold will take their place this fall to represent a unified LIU. Green and gold have given Post an identity for over half a century; they served as a base for building a sense of belonging among students and faculty; and they’ve been an expression of the Pioneer school spirit at sporting and recreational events. The Pioneer theme is everywhere: on the walls and furniture, in the tiled floor patterns, upon the banners aligning the campus roads, and printed on school merchandise, uniforms and the gymnasium floor. Some students are left wondering when the color changes will take effect and how much it will cost. Academic halls and athletic facilities will have to undergo renovations to reflect the merger. Freshman business major, Alec Salgado, has concerns about the transition. “Since the colors are changing, it’s going to be a huge financial thing for the school. A lot of the buildings are going to be changed because we have a lot of green and gold stuff around. It’s everywhere. It’s going to be really hard,” he said. The Pratt Recreation Center, where the merged athletic teams will practice, is saturated with Pioneer colors. 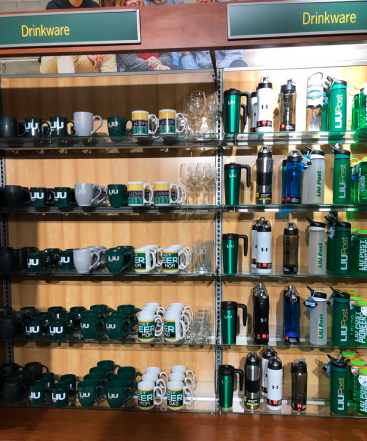 According to Casey Schermick, director of athletic media relations, there are hundreds, if not thousands of items around campus consisting of green and gold. “As time goes on, these items will be rebranded to match the new color scheme,” he said. “This will definitely be a rollout project that will be transformed over time.” He added that the new combination of colors is one of many ways to carry on the traditional spirit of each campus. “LIU will be recognizable with accenting colors from both Post and Brooklyn athletic departments,” he said. However, he cannot confirm a timetable as to when it will be completed. Pratt’s gym floor displays the Pioneer brand in big, bold lettering; it’s a definite change needed before the switch. “During summer break each year, the gym floor is stripped down to the base wood and refurbished. Once decided, the plan would be to make the color changes during this time,” Roy Fergus, executive director of facilities, said. Blue and gold will eventually be reflected in all aspects of athletics, including signage and website design, social media, and uniforms. Currently, the university is exploring options for a “unified apparel company” to outfit all athletic teams beginning in the fall, according to Schermick. New uniforms will be ready to wear for preseason in late summer. A new mascot, which has yet to be determined, will also receive blue and gold gear with a new logo, wordmark and icons.